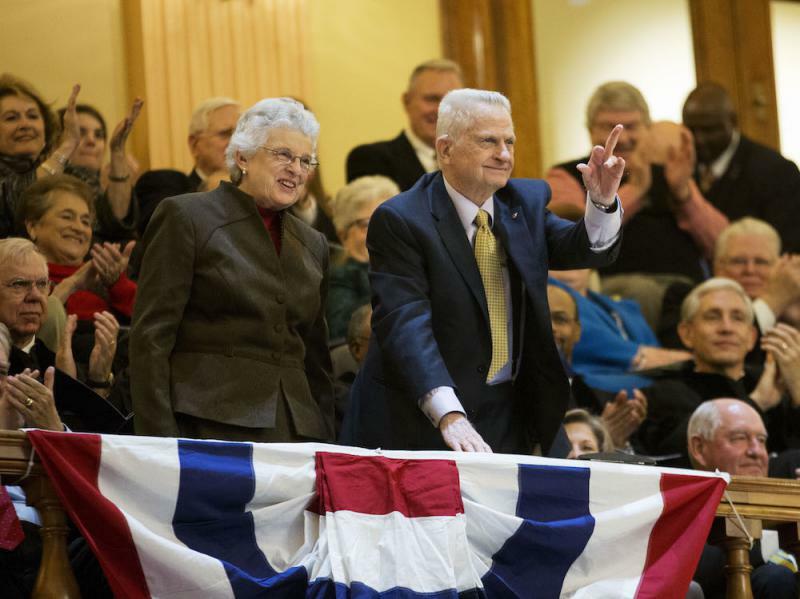 Former Georgia Governor Zell Miller, right, waves when acknowledged with wife Shirley during an inaugural ceremony for Georgia Gov. Nathan Deal at the state Capitol, Monday, Jan. 12, 2015, in Atlanta. Former Georgia Governor and U.S. 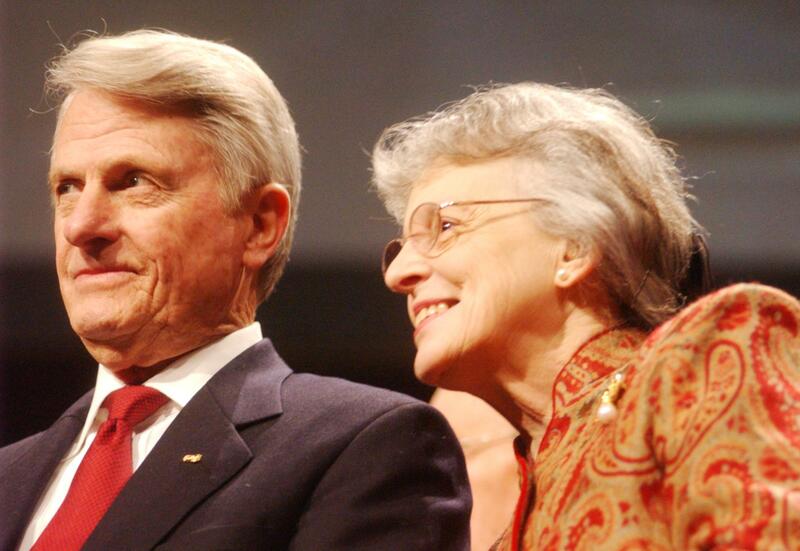 Senator Zell Miller has died at the age of 86, following treatment for Parkinson's disease. He served as Governor from 1991-1999. While in office he created the HOPE Scholarship and Georgia’s Voluntary Pre-Kindergarten Program. He went on to serve in the U.S. Senate for five years. Miller was a conservative Democrat. He gave a keynote speech at the Democratic National Convention in 1992 and the Republican National Convention in 2004. His grandson, Bryan Miller, says his grandfather passed away peacefully at home with his family by his side. "As his grandson, I learned more from Zell Miller both professionally and personally than from anyone else I have encountered," he said. "He was more than my grandfather. He was my dear friend and mentor. I cherish all the time we spent together. I will never forget the lessons he taught me, his witty sense of humor, or his contagious smile. Our family will miss him terribly." "It is with a heavy heart that Sandra and I offer Shirley our deepest condolences on the passing of her devoted husband, Zell. Georgia has lost a favorite son and a true statesmen, and I’ve lost a dear friend. Zell’s legacy is unequaled and his accomplishments in public service are innumerable. Without question, our state and our people are better off because of him. But the mark Zell made in his private life — as a dutiful son, a loving husband, and a proud father and grandfather — are the ones of which I’m sure he was most proud. I was honored to serve with him in the Senate and have cherished his counsel for decades. My thoughts and prayers are with his family, friends and loved ones, of which he had many. May God bless him and keep him." Zell Miller and his wife Shirley attend former Governor Sonny Perdue's first term inauguration in 2003. "With the passing of Zell Miller, Georgia has lost its finest public servant, and I have lost a great friend. I do not know of anyone who impacted the lives of Georgians more than Zell. His Marine Corps values of patriotism and loyalty guided his career in service to his state and his country. Zell and Shirley will always be Georgia's first family. I treasure their friendship. Dianne and I hold the Miller family in our prayers." Miller's family says funeral arrangements have yet to be announced but people can share condolences here.